Albert Einstein might have mastered how speed and light relate to each other , but he had some trouble figuring the theory of relatives. 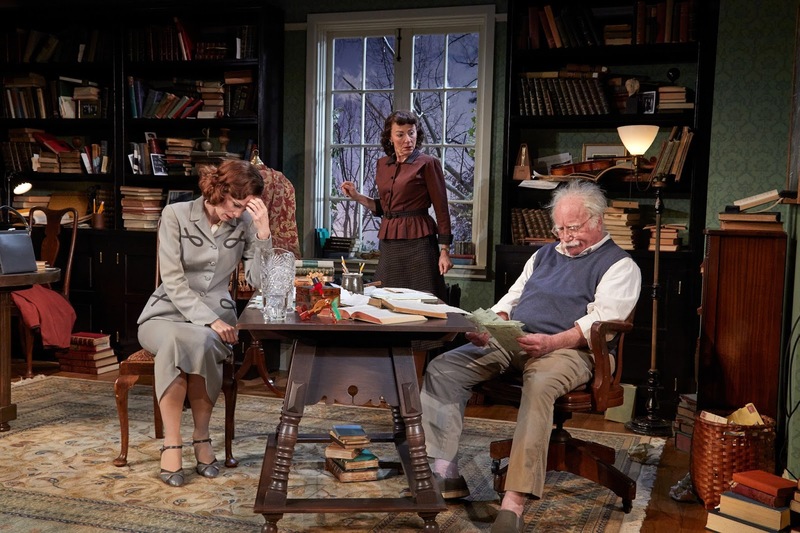 Richard Dreyfuss stars as the genius physicist in Relativity, a new play by Mark St. Germain (Freud's Last Session, Becoming Dr. Ruth) at TheaterWorks, directed by Rob Ruggiero. The Nobel Prize winner who gave us E=MC2 and the atomic bomb welcomes another reporter to his Princeton home (designed by Brian Prather) where his housekeeper, Helen Dukas (Lori Wilner), is convinced that government agents are checking Einstein's trash to find evidence that he is a spy and is suspicious about whether Margaret Harding (Christa Scott-Reed), really works for the Jewish Daily. She might be right (about the reporter and those guys going through the trash). Harding starts asking difficult questions about Einstein's strained relationship with his sons and in particular, his first wife Mileva Marić. What happened to Liesrl, the daughter they had out of wedlock in 1902 who was never seen again after 1904? Did she die in infancy or was she given up for adoption? Those questions form the basis for an examination of choices made and the importance of relationships -- a process that makes Einstein realize that being a successful man doesn't always mean he has been a "good" man. The quick 80 minutes gives Oscar-winner Dreyfuss ("The Goodbye Girl"), in the expected white shock of hair (Wig Design by Leah Loukas), an opportunity to shine. He and Wilner have a nice rapport as they depict long-time companions who know each other too well, and Ruggiero achieves comic relief without letting it go too far. After all, Einstein might not be the gentle, absent-minded guy we think he is. 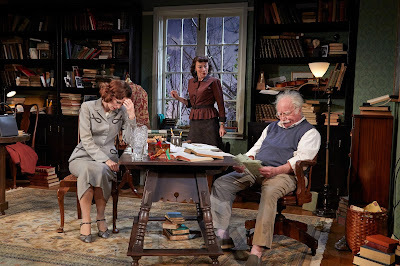 The plot itself, is a fantasy of the playwright based on sketchy information about Einstein's daughter. Einstein probably would have enjoyed that, having said, after all that "imagination is more important than knowledge." The story, however, is implausible in parts. The opening scene (which is not necessary) has a publicity-weary Einstein inviting Harding to his home where he quickly answers questions about the most intimate relationships in his life even though it is obvious that she has an ulterior motive. An audience member -- in that helpful way of audience members who think everyone around them wants to hear that they have figured out an until-then secret of the plot and blurts it out loud -- figured out what was happening very early on, as did most of us. St. Germain should eliminate the element of surprise that really isn't and get right into why this woman really shows up on Einstein's doorstep. Relativity has triggered some heavy box office traffic at TheaterWorks, 233 Pearl St. Hartford, and the run has been extended twice, now through Nov. 23. Performances are Tuesday, Wednesday and Thursday at 7:30 pm; Friday and Saturday at 8 pm; Saturday and Sunday at 2:30 pm. Tickets are $15 to $75: theaterworkshartford.org; 860-527-7838. A conversation with Dreyfuss moderated by Ruggiero and award-winning filmmaker Pedro Bermudez. Tickets are $40, $50 and $75.